In a way this post is about how to draw the hand, but it is really about learning to simplify the forms you see to better understand what you are drawing. 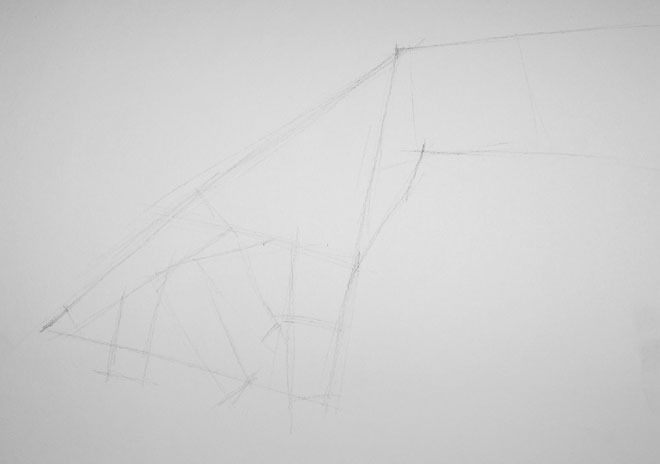 Today, I want to focus on drawing complex structures by finding the simple shapes first. 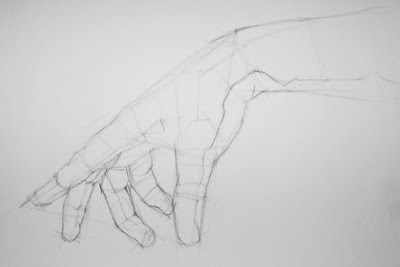 I thought I'd demonstrate this by walking through the steps of looking at a complex form and understanding the hidden simple shapes by drawing a hand. The hand above is final result of my demonstration about looking for the shapes within. 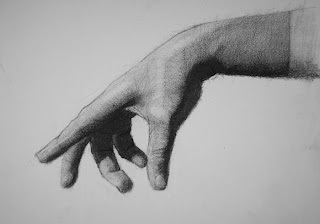 I chose the hand because it is one of those forms that takes on dramatically different shapes depending the action of the person and the vantage point you are looking at it. 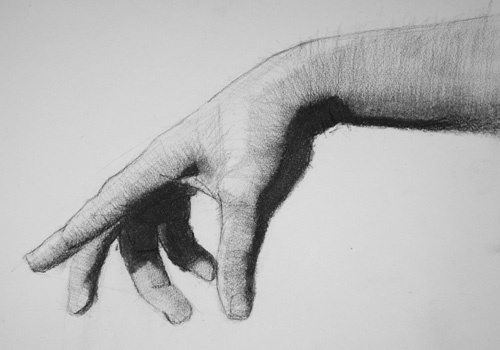 I am not going to focus on the anatomy or the proportions of the hand, those will be for another day. Today it's all about simple shapes. We are going to see that we can manage to draw complex shapes by looking at the largest shapes first then using those large shapes as reference to find and place the smaller shapes as we go. 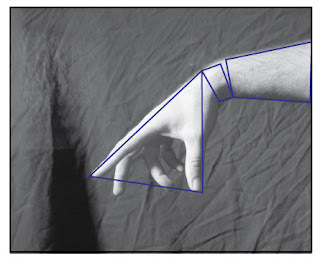 Here you will see the two images of hands, one is of a side view and one is view with the palm facing forward. I drew over the images the largest simple shape that defines the shape of the hand from the our viewpoint. 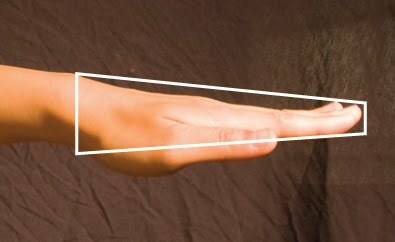 The simple shape of a hand seen from the side is that of a wedge. Seen with the palm facing the viewer the hand is basically a rectangle. 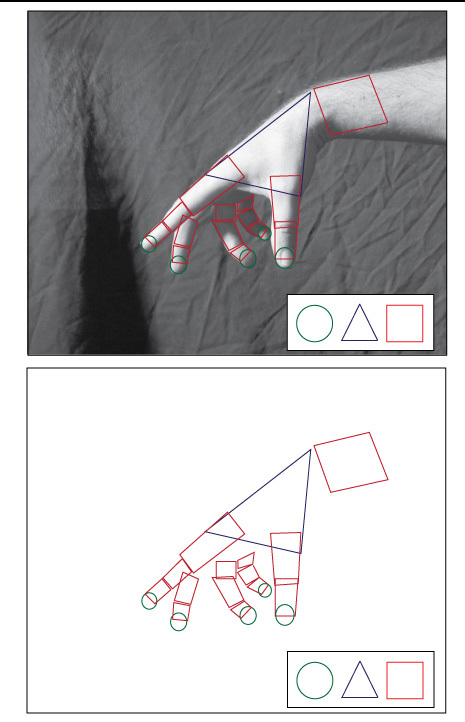 Both images reflect how the hand can been viewed in terms of the most basic shapes. When in action, however, we hardly see the hand in these forms and hand takes on shapes that never seem so simple. 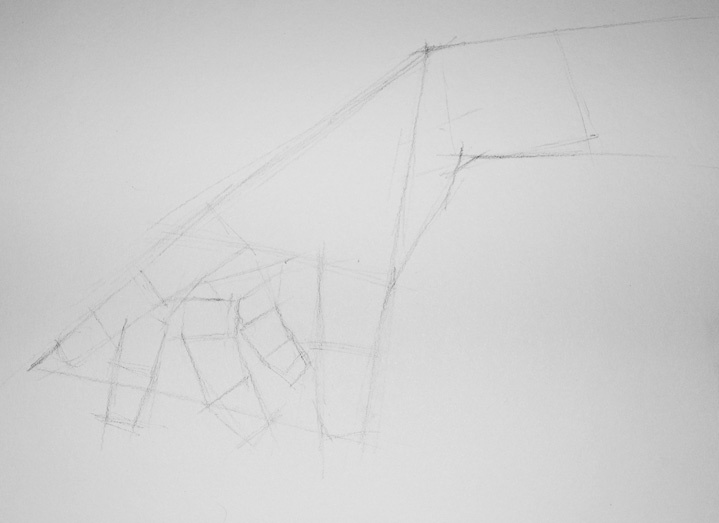 The trick is really just to simplify it, abstract those weird twisted forms into easily understood shapes. Here is what we are going to work with. Something not that hard and a hand in a position you may see in life. 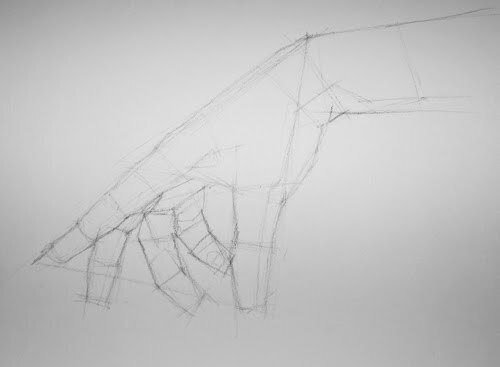 I chose a hand that, though is has minimal movement, it has a position that works well for demonstrating simple shapes. The lighting on the hand is from a single light source. This will make it easier when dealing with the value later. For fun, I have overlaid some of the simple shapes that can be found in hand held this position. Most forms can be broken down into three simple shapes, the circle, triangle and square, and their variations. 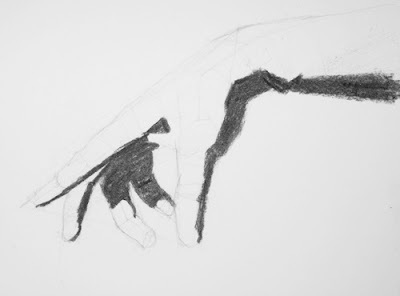 Looking and the image where I have removed the photograph of the hand, notice how the hand can be seen structurally in flat basic shapes. 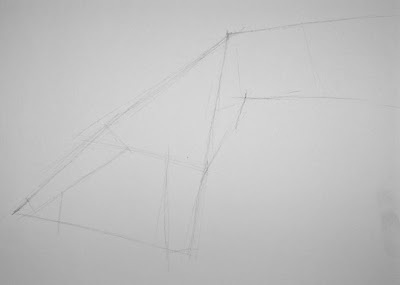 When starting a drawing you want to block in the largest shapes first then refine as you go; looking for the smaller shapes, checking placement, and the finding even smaller shapes until one has defined the object in terms of shapes and planes. Of course this isn't only way to go about drawing a complex structure but I figure it works so why not give it a try. 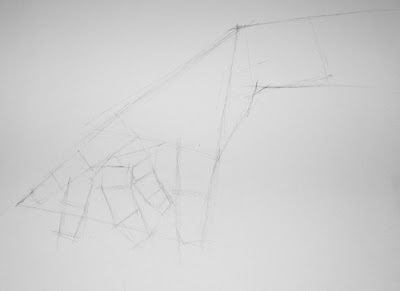 To the left I have laid out the large basic shapes I see when I look and this hand. I will use these shapes as references throughout the drawing process. First, block in the large overall shape of the hand, then the smaller structures of the thumb and figure. Find the smaller shapes and draw them in using the larger shape as a reference or guide for placement of these smaller forms. Careful not to go to fast in this process. It is tempting to want to put all the forms and shapes in as you see them. Be selective in the shapes you decide to draw next. Next, look for and draw in the smaller shapes. 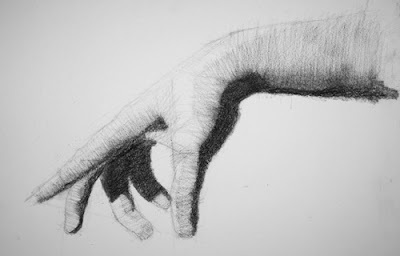 In this case the rest of the fingers and more of the hand and wrist. Don't worry about the joints or bends of the fingers yet. We aren't there yet. Just get everything in the right place. Its the same steps again, look for the smaller shapes and map them out in the drawing. This is a process of repeating the steps of drawing in the shapes, just keep refining as you go. Remember to keep checking the placement of your new shapes against your reference of the ones that you laid down earlier. Keep refining the shapes and begin to look for surface plane changes and where the plane transitions. Surface planes are still just shapes that define the form. This time the shapes we are working with are less abstract and hidden, The shapes are beginning to represent the surface area of the hand. Continue to refine the shapes you see down smaller and smaller until you are comfortable you have enough information to work with when it comes time to render the form in value..
As I refine the form and look for the plane changes, I decided that now was a good time to start mapping out the edges of the shadows. Besides mapping out the light side and dark side of the hand, shadows can be useful guides in finding the more plane changes. Next its time to add the values and render the form realistically. Here, I started by massing in the shadow shapes with vine charcoal. I start by shading in the darker surfaces first and work towards the lightest surfaces. I am sure there are many questions about rendering the form. I will post more on that later. What I what you to remember here is that complex forms can always be broken down into simpler forms for easier understanding and drawing. Just remember to keep the basic shapes in mind and to work from the big shapes to small ones. 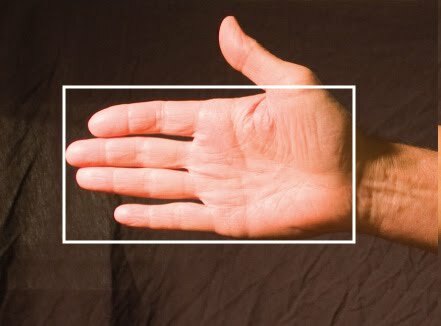 To see proportional guides for hands click here.